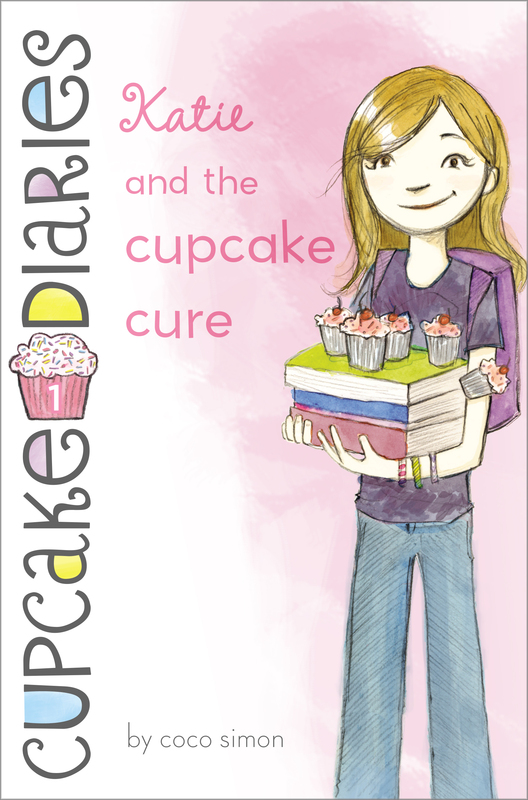 The Cupcake Club gets its start in this first book of a sweet treat of a series! Katie Brown is miserable when her best friend is invited to join the Popular Girls Club and Katie is left out. Is there an Unpopular Girls Club she can join? Fortunately, Katie finds her way with a great new group of friends—Mia, Emma, and Alexis—and together they form the Cupcake Club. Sometimes starting from scratch turns out to be the icing on the cupcake! CHAPTER 1 Who’s Afraid of Middle School? Not Me! My name is Katie Brown, and whenever I watched those movies, I just didn’t get it. I mean, how could middle school be that different from elementary school? Yeah, I knew there would be new kids from other schools, but I figured everyone from our school would stick together. We’ve all pretty much known one another since kindergarten. Sure, not everybody hangs out together, but it’s not like we put some kids on a pedestal and worship them or anything. We’re all the same. Back in third grade, we all got sick together on mystery meat loaf day. That kind of experience has to bind you for life, doesn’t it? That’s what I thought, anyway. I didn’t spend one single second of the summer worrying about middle school. I got a really bad sunburn at the town pool, made a thousand friendship bracelets at day camp, and learned from my mom how to make a cake that looks like an American flag. I didn’t stress out about middle school at all. Guess what? I was wrong! But you probably knew that already. Yeah, the cruel hammer of reality hit pretty hard on the very first day of school. And the worst thing was, I wasn’t even expecting it. The morning started out normal. I put on the tie-dyed T-shirt I made at day camp, my favorite pair of jeans, and a new pair of white sneakers. Then I slipped about ten friendship bracelets on each arm, which I thought looked pretty cool. I brushed my hair, which takes about thirty seconds. My hair is brown and wavy—Mom calls it au naturel. I only worry about my hair when it starts to hang in my eyes, and then I cut it. When I went downstairs for breakfast, Mom was waiting for me in the kitchen. “Happy first day of middle school, Katie!” she shouted. Did I mention that my mom is supercorny? I think it’s because she’s a dentist. I read a survey once that said that people are afraid of dentists more than anything else, even zombies and funeral directors. (Which is totally not fair, because without dentists everybody would have rotten teeth, and without teeth you can’t eat corn on the cob, which is delicious.) But anyway, I think she tries to smile all the time and make jokes so that people will like her more. Not that she’s fake—she’s honestly pretty nice, for a mom. The pancake sat on a big white plate. Mom had used banana slices for wheels and square pieces of cantaloupe for the windows. This might seem like a strange breakfast to you, but my mom does stuff like this all the time. She wanted to go to cooking school when she got out of high school, but her parents wanted her to be a dentist, like them. Which is unfair, except that if she didn’t go to dental school, she wouldn’t have met my dad, and I would never have been born, so I guess I can’t complain. But anyway, in her free time she does the whole Martha Stewart thing. Not that she looks like Martha Stewart. She has brown hair like me, but hers is curly, and her favorite wardrobe items are her blue dentist coat and her apron that says #1 CHEF on the front. This morning she was wearing both. “Thanks, Mom,” I said. I didn’t say anything about being too old for a pancake shaped like a school bus. It would have hurt her feelings. Besides, it was delicious. She sat down in the seat next to me and sipped her coffee. “Do you have the map I printed out for you with the new bus stop location?” she asked me. She was doing that biting-her-bottom-lip thing she does when she’s worried about me, which is most of the time. Barbara is my mom’s best friend—and she’s also the mom of my own best friend, Callie. We’ve known each other since we were babies. Callie is two months older than I am, and she never lets me forget it. “Uh, yeah,” I said, and quickly gulped down some orange juice. I hadn’t actually talked to her. But we’d been bus buddies ever since kindergarten (my corny mom came up with “bus buddies,” in case you didn’t figure that out already), so there was no real reason to believe this year would be any different. I knew I’d see her at the bus stop. Every August, Callie goes to sleepaway camp, which totally stinks. She doesn’t get back until a few days before school starts. Normally I see her the first day she comes back and we go to King Cone for ice cream. But this year Callie texted that she was busy shopping with her mom. Callie has always cared a lot more about clothes than I do. She wanted to find the perfect outfit to wear on her first day of middle school. And since we only had a few days before school started I didn’t think it was that weird that I didn’t see her. It was a little weird that she hadn’t called me back. But we had texted and agreed to meet on the corner of Ridge Street, so I was sure everything was fine. I ate my last bite of pancake and stood up. “Gotta brush my teeth,” I said. When you’re the daughter of a dentist, you get into that habit pretty early. Soon I was slipping on my backpack and heading for the door. Of course, Mom grabbed me and gave me a big hug. “I packed you a special lunch, Cupcake,” she said. Mom has called me Cupcake ever since I can remember. I kind of like it—except when she says it in front of other people. “I love you!” Mom called. I turned and waved. For a second I thought she was going to follow me to the bus so I yelled, “I love you too!” and ran down the driveway. Outside, it still felt like summer. I should have worn shorts, I thought. There’s nothing worse than sitting in a hot classroom sweating a lot and having your jeans stick to your legs. Gross. But it was too late to change now. Ridge Street was only two blocks away. There were lots of kids heading for the bus stop, but I didn’t see Callie. I stood on the corner, tapping my foot. “Come on, Callie,” I muttered. If we missed the bus, Mom would insist on walking me to the bus stop every morning. I didn’t know if I could take that much cheerfulness before seven thirty a.m.
Then a group of girls turned the corner: Sydney Whitman, Maggie Rodriguez, and Brenda Kovacs—and Callie was with them! I was a little confused. Callie usually didn’t walk with them. It was always just Callie and me. “Hey, Cal!” I called out. Callie looked up at me and waved, but continued talking to Maggie. That was strange. I noticed, though, she wasn’t wearing her glasses. She’s as blind as a bat without her glasses. Maybe she doesn’t recognize me, I reasoned. My hair did get longer this summer. So I ran up to them. That’s when I noticed they were all dressed kind of alike—even Callie. They were wearing skinny jeans and each girl had on a different color T-shirt and a thick belt. “Hey, guys,” I said. “The bus stop’s this way.” I nodded toward Ridge Street. Callie looked at me and smiled. “Hi, Katie! We were just talking about walking to school,” she said. “Isn’t it kind of far to walk?” I asked. “As a matter of fact, I did,” I said. I looked at Callie. I didn’t say anything. She didn’t say anything. What was going on? She didn’t say, “Come on, everybody but Katie,” but she might as well have. I knew I wasn’t invited. Callie turned around and waved. “See you later!” she called. I stood there, frozen, as my best friend walked away from me like I was some kind of stranger.